How Will the Tax Cuts and Jobs Act Impact You and Your Family? As a result of The Tax Cuts and Jobs Act (TCJA) that was signed into law on December 22, 2017, you may have lower taxes this year. You also may have higher taxes. It depends on your situation, but one thing's for sure: significant changes are coming to your taxes. While the bill includes a plethora of changes too numerous to cover in this article, here are the highlights with emphasis on topics that are likely to apply to police officers and their families. Individual income tax rates are reduced for most Americans. There are still seven income tax brackets. All but the 10% and 35% bracket were lowered. The new tax rates for the seven brackets are 10%, 12%, 22%, 24%, 32%, 35%, and 37%. For most police officers, this means your income tax rate will be lower this year. While the TCJA did repeal the deduction for personal exemptions, it nearly doubled the standard deduction for taxpayers across the board. This could simplify things for some police families who currently itemize, as the standard deduction may now exceed their itemized deductions. Consult with your tax professional this year about whether or not you'll still need to itemize. If you don't have a tax professional yet, it's a good year to get one. State and local taxes deduction capped—Individuals can only claim an itemized deduction of up to $10,000 ($5,000 if married filing a separate return) for state and local property taxes and state and local income taxes (or sales taxes in lieu of income). Home mortgage interest deduction reduced—Individuals can deduct mortgage interest on no more than $750,000 ($375,000 if married filing a separate return) of qualifying mortgage debt. No deduction is allowed for interest paid on home equity loans. Medical expenses—The adjusted gross income (AGI) threshold for deducting unreimbursed medical expenses is retroactively reduced from 10% of AGI to 7.5% of AGI for 2017 and 2018, after which it returns to 10% of AGI. This threshold also applies for purposes of calculating the alternative minimum tax (AMT) for 2017 and 2018 as well. Casualty and theft losses—The deduction for personal casualty and theft losses is eliminated, except for casualty losses suffered in a federal disaster area. Miscellaneous itemized deductions—Miscellaneous itemized deductions that would be subject to the 2% AGI threshold, including tax-preparation expenses and unreimbursed employee business expenses, are no longer deductible. The child tax credit is doubled from $1,000 to $2,000 for each qualifying child under 17. The income level at which the credit begins to phase out is increased to $400,000 for married couples filing jointly and $200,000 for all other filers. The credit will not be allowed unless a Social Security number is provided for each qualifying child. Alimony and separate maintenance payments will not be deductible by the paying spouse, and won't be included in the income of the recipient. While we're on the topic kids, let's talk about education. Under the new law, the definition of a "qualified education expense" under a 529 college savings plan has been expanded to include K-12 expenses. Starting in 2018, annual withdrawals of up to $10,000 per student can be made for tuition expenses from enrollment in an elementary or secondary public, private, or religious school (excluding home schooling). These withdrawals are now tax-free at the federal level. At the state level, roughly 20 states and the District of Columbia automatically update their state legislation to align with federal 529 legislation, but the remaining states will need to take legislative action to include K-12 expenses as a qualified education expense. Make sure you understand your state's rules regarding how K-12 funds will be treated for tax purposes—another reason to consult with your tax professional. In addition, check with the 529 plan administrator to determine whether a K-12 withdrawal request should be made payable to the account owner, the beneficiary, or the K-12 institution. A list of 529 plans offered, by state, and a comparison tool are available at collegesavings.org. The penalty imposed by the Affordable Care Act for failing to have adequate health insurance coverage is permanently repealed in 2019. The federal estate and gift tax exemption amount is doubled to $11.2 million for individuals and $22.4 million for couples in 2018, with inflation adjustments in following years. This means all but the wealthiest of Americans will pay no estate tax. In a permanent change that starts in 2018, Roth conversions (converting a Traditional IRA to a Roth IRA) cannot be reversed by re-characterizing the conversion. For divorce or separation agreements effective after December 31, 2018 (or modified after that date to specifically apply this provision), alimony and separate maintenance payments are not deductible by the paying spouse, and are not included in the income of the recipient. This is a permanent change. 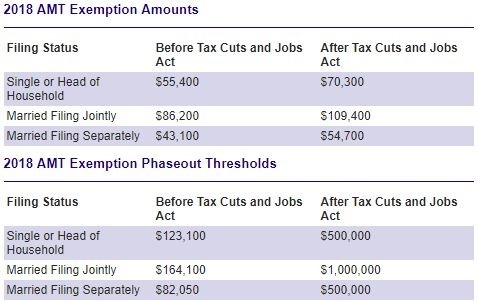 The TCJA increases the AMT exemption amounts as well as the income thresholds at which the exemptions phase out. See the chart, below. If you receive business income from a pass-through entity, like an S Corp, partnership, or sole proprietorship, you get a new deduction equal to 20% of qualified business income, IF you're single and your taxable income doesn't exceed $157, 500. If you're married, the requirement is that your taxable income not exceed $315,000. 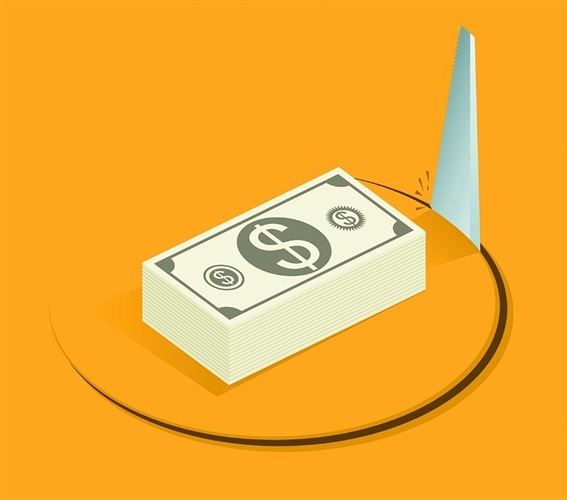 Bonus depreciation provisions are going away over time. Without getting into the weeds of all the numbers and specific timelines, if your business is currently depreciating property, and you've been taking advantage of bonus depreciation, it's going away. The new law provides a phase-out of bonus depreciation until it is completely eliminated by 2027. The flip-side of this is that small businesses can now elect under IRC 179 to expense the cost of certain property, rather than depreciate it. In 2018, the maximum amount that can be expensed is raised from $520,000 to $1 million, and expands the range of property eligible for expensing. The $1 million threshold will also be increased to reflect inflation in years after 2018. It used to be that businesses could deduct 50% of the cost of meals and entertainment that were directly related to business. This deduction was eliminated. No deduction is allowed for (1) activities generally considered to be entertainment, amusement, or recreation, (2) membership dues with respect to any club organized for business, pleasure, recreation, or other social purposes, or (3) a facility or portion thereof used in connection with items (1) and (2). Employers can still deduct 50% of the food and beverage expenses associated with operating their business (travel meals for employees). Again, this article is just a summary highlighting major changes that are likely to impact most police families. I hope this made you aware there are significant changes in tax law that may apply to your situation. Please consult with your tax professional to make sure you're aware of the changes that will affect you. A 15-year veteran of law enforcement from the Kansas City area, Adam Doran is now a fulltime financial advisor who focuses on helping police officers achieve their financial goals. You can email him directly at [email protected].